This dual channel VGA HDMI/DVI video mixer is an ideal solution for users to effortlessly combine any two video feeds for display on one screen. 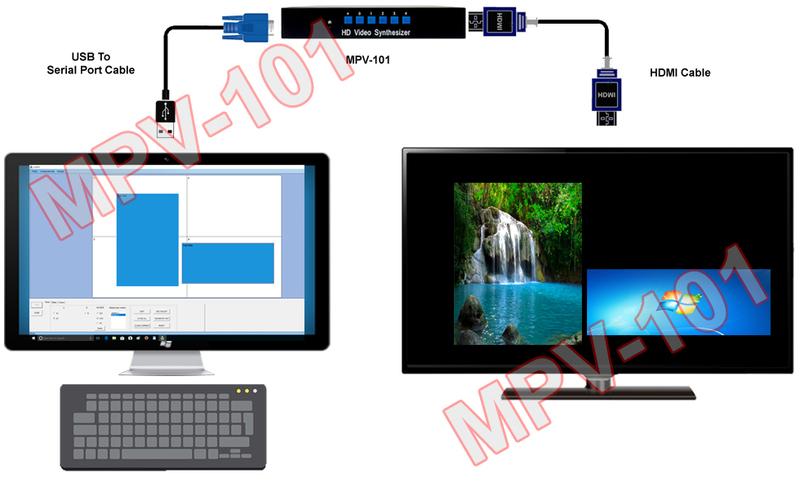 This split-screen VGA/DVI/HDMI PIP processor supports 2 DVI/HDMI inputs and 2 VGA inputs. Any 2 of the 4 inputs can be combined into one screen and outputted simultaneously in HDMI and VGA format with adjustable window size and screen position. Users can use the supplied IR remote for fast operation such as selecting between default/custom split screen modes, video inputs and so on. More detailed screen controls such as the video window position, video output sizing can be achieved through the RS232 software control using a PC with RS232 link with this video mixer. 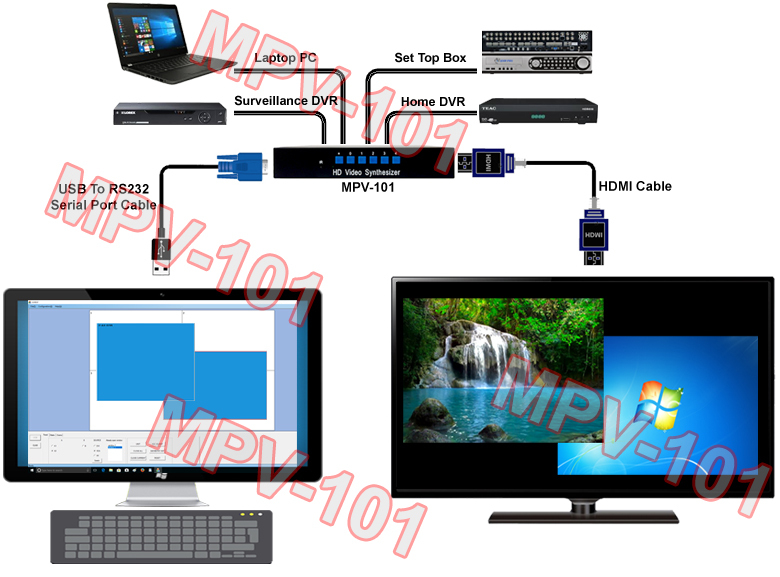 The maximum VGA/DVI output from this video process is up to 1920x1200 pixels or HD 1080p. This digital video processor system is featured with dual-channel frame synchronized output and switching. The internal frame synchronizer can help re-generate all sync signals from inputs for smooth and quality video output. Dual video outputs are provided in both analog (VGA) and digital (HDMI/DVI) format for local monitoring, presentation and other purposes. Both HDMI and VGA output are displayed in real time with no latency. The featured detail enhancement function of this video processor will improve the image detail on a pixel-by-pixel basis, delivering sharper and clear images. This multi-function video mixer supports various screen modes including Picture-In-Picture (PIP), 2-channel split-screen(PAP) and full-screen display for single channel. With PIP support, users can view two video sources on the same TV, one video shown in the main TV screen with 2nd video shown in smaller video window on top of the main channel. This split-screen video system is a stand alone unit, useable out of the box for easy setup. It also provides a RS232 serial port for link with PC so users can customize the PIP or split screen formation through the RS232 control software included in the package. video input selection for main window, PIP window or PAP window. positioning video windows on the screen . And the new split screen layout will be reflected on the TV or projector screen in real time. For detailed control and operation, users can use a PC with the RS232 software installed for controlling this video mixer through its RS232 console link. The PC control software is easy to use and allows users to change the size or location of the 2 video windows from the software screen. And the video mixer hardware will synchronize with TV or the monitor display to show the new screen formation created by user. so users can quickly bring up the desired screen formation for presentation. Fast setup without re-configuring the system again next time. 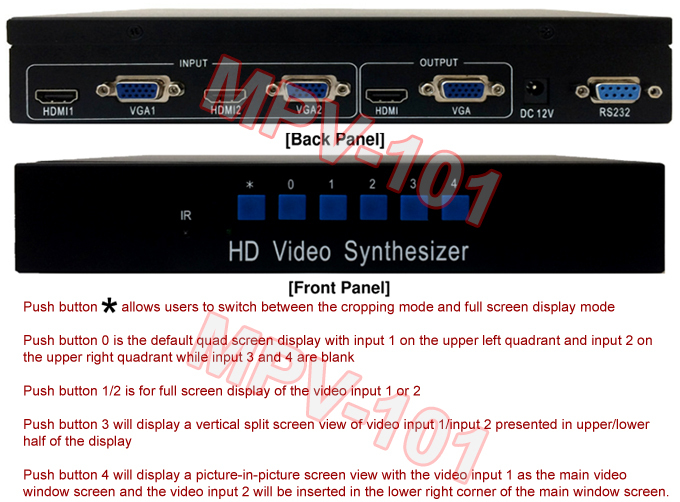 Professional HDMI VGA video mixer for displaying dual video or computer screens on single TV monitor with optimized image quality and sensational results. All-in-1 video mixer, video format converter, video switcher and video splitter. Supports 2 DVI/HDMI inputs and 2 VGA inputs. Any 2 of the 4 inputs can be combined into one screen and outputted simultaneously in HDMI and VGA format for supreme quality graphics, fine text and crisp video images. Designed for high-clarity applications with selectable digital HDMI/DVI and analog VGA output resolutions up to 1080P or 1920x1200 pixels. 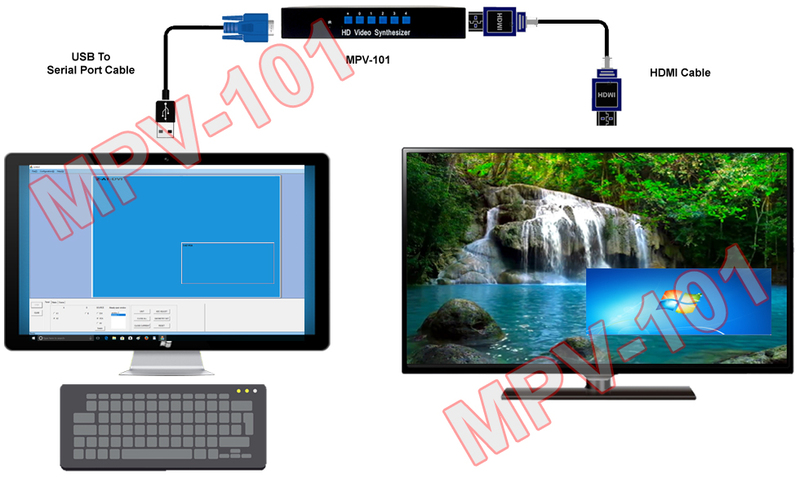 Dual VGA/DVI outputs are provided so one is connected for simultaneous remote display and real time on-site monitoring. Featured with dual-channel frame synchronizer allowing video mixing of any two A/V sources in real time with no lags. 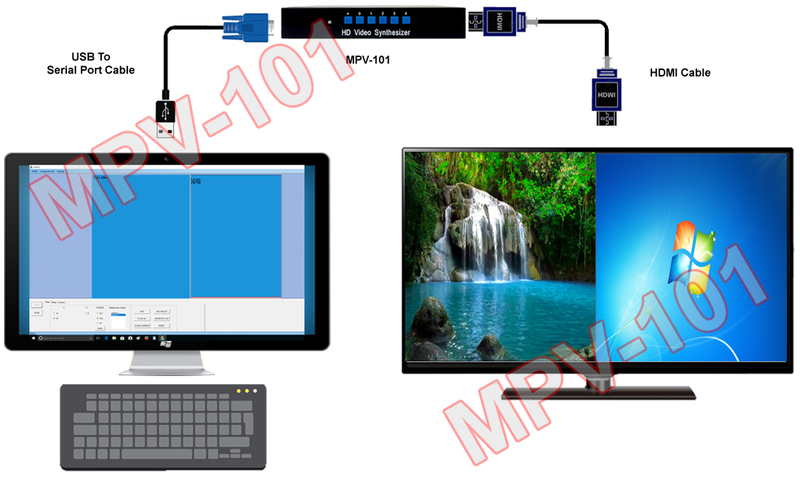 Easy PC software control for custom multi-view screen layout design and adjustable PIP/PAP video window sizes and position. 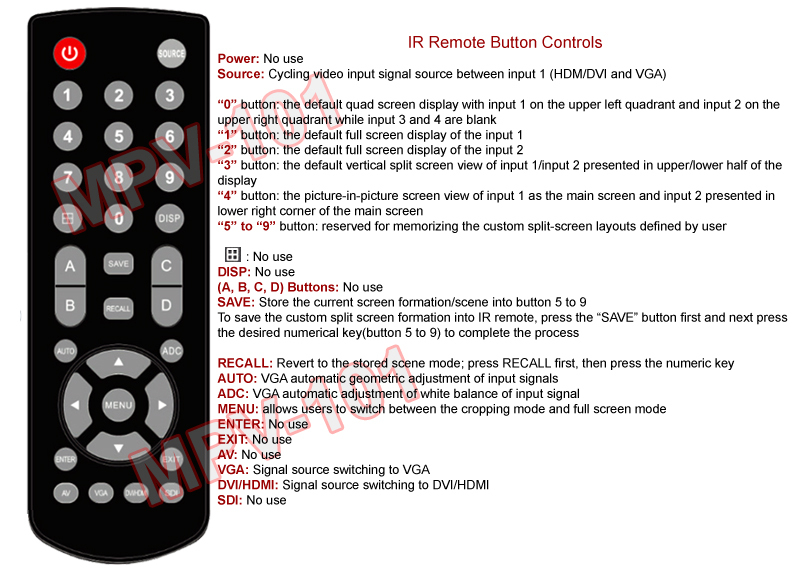 IR remote offers total of 9 screen mode selection, 4 default screen modes + 5 custom-made layouts created by using the PC software. Unlimited number of custom-made screen layouts created by PC software can be stored into the mixer hardware. Cascade modules to add more input source signals in video windows to be displayed on one monitor. 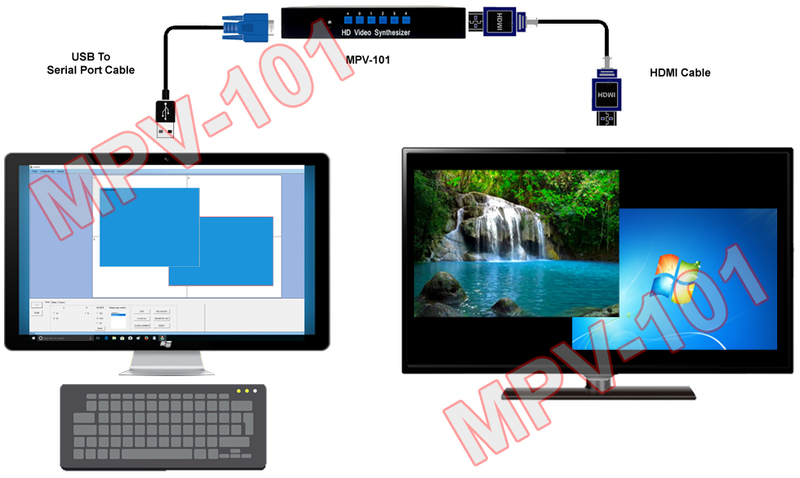 PC RS232 control software supports all windows OS including Win10, Win 8/8.1, Win7, Vista and XP. Worldwide video system support for all NTSC and PAL inputs.